There's been discussion of late as to whether Gillard or Abbott is the bigger liar. It is time to settle this argument with a simple challenge. Post documented examples of the lies. Verbatim quotation with proper context. For example, if the statement is an answer to a question, the question and answer must both be posted in full. If a lie is a part of a larger context, highlight the lie in bold. A link to the source for the quotation, preferably a primary source or a secondary source that identifies a primary source. A date must be provided. If a source also specifies an exact time (eg: Hansard) this should be provided as well. Evidence to support the proposition that the statement is a lie. Such evidence must also include citations. To ensure a fair comparison, we should limit the lies told by both politicians to the time when both were federal Members of Parliament - that is, no earlier than 3 October 1998, the date on which Julia Gillard became the Member for Lalor. (Tony Abbott became the Member for Warringah on 26 March, 1994.) Lies from earlier than this can be posted if desired but won't be included in the comparison. Lies about political matters or matters in the public interest should get priority. Whether it's a stealth tax (like) the emissions trading scheme, whether it's an upfront and straight forward tax like a carbon tax, there will not be any new taxes as part of the Coalition's policies. QUESTION: Mr Abbott, is a carbon tax part of your alternative climate change policy? TONY ABBOTT: Louise, the Coalition will not be going to the election with a new tax. Whether it’s a stealth tax, the emissions trading scheme, whether it’s an upfront and straightforward tax like a carbon tax, there will not be any new taxes as part of the Coalition’s policy. QUESTION: Mr Abbott, if you’d had this is in your mind for so long, why did you give a promise only a few weeks ago not to have any new or increased taxes? TONY ABBOTT: That’s a fair question, Michelle. But sometimes, for very important purposes, for very good reasons, you have to make departures from principle. Now, obviously we are the party of lower taxes, smaller government and greater freedom. We’re also the party of a fair go for families and respect for institutions that have stood the test of time. Now, generally speaking, of course I support lower taxes, but I also support a fair go for families and given the waste and extravagance, given the debt and deficit that we’ve had from this government, in the short and medium term the only way to secure a fair go for families through a paid parental leave scheme which is a fair dinkum scheme, is with this modest levy on the profits of larger businesses. Now, as I explained in the Parliament yesterday, were the fiscal position of the Commonwealth to be different we would have done this differently, but given the circumstances that we find ourselves in the only way to get a fair dinkum scheme is to have this levy on the taxable income of larger businesses. Besides the fact that you did not read the topic heading, your example of a lie is rather weak. Hockey's claim is meaningless pollie speak but you can't prove it was a lie. 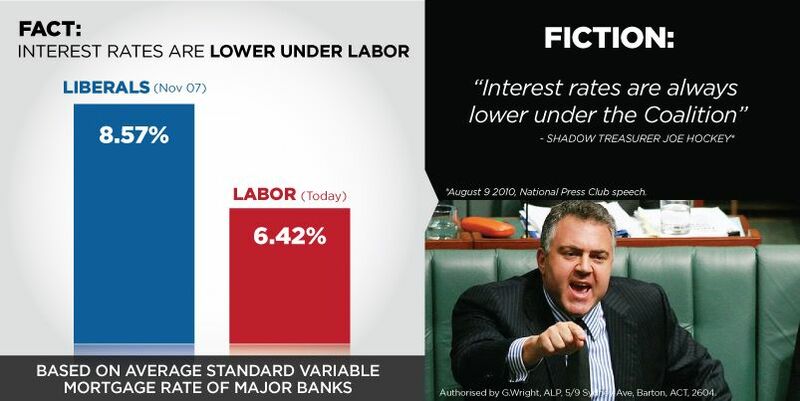 Interest rates always lower under the Coalition, implies under a Coalition government. As their was no ALP government in November 2007 (to check if the interest rates would have been higher still) and there was no coalition government today (to check if interest rates could have been lower) it is impossible to verify such a claim. On the other hand any political leader who solemnly promises just before a tight election there will be no...... (fill in the blanks) under a government I lead, can be called to account for any such unambiguous statements. TONY JONES: Not that you can recall, because we believe that you've had at least one meeting with him quite recently? TONY ABBOTT: Ah, actually now that you do mention it, I did met with Cardinal Pell. Why shouldn't I meet with Cardinal Pell? TONY JONES: Why couldn't you recall meeting him, I think, 10 days ago? TONY ABBOTT: Look, whenever it was, so what? Why shouldn't I meet Cardinal Pell. Cardinal Pell is a fine man. I class this as a lie. "Not that I can recall" is about as believable as Sinodinos "forgetting" 6 company directorships. Did you propose a $10,000 payment for stay at home mums? Did you propose any payments for stay at home mums? And was that one knocked back? …but what matters, but what matters is the decisions that were made. No, what matters, did you put it up and it was knocked back? No, No. What matters is the decisions that were made. So, you’re denying that you put this to the Shadow Cabinet are you? I’m saying that we had a discussion that covered all sorts of subjects. Yeah, but I asked you if you put it up and you said, no, no. So, are you denying that you put it up? And the point is, Neil, you know, conversations that take place in the Shadow Cabinet are conversations that I am allowed to keep to myself and fellow Shadow cabinet members. So, I’m just asking, is it a denial or not? What I’ve said is what I’ve said and you can put whatever construction you like on it. No, but you’ve been contradictory. You said no, no and then you went on to say you wouldn’t say. It’s a simple thing. Was this discussed? Was it raised? Was it rejected? Well, let’s just be up front because a minute ago you said no, no. And what we decided was that the reckless spending must stop. Alright, the reports as you’re well aware is that you put it up and that you were rolled by the Shadow Cabinet. Is that right? Well, what is a fair construction? Well, what about doing it for the Australian people? Forget me. I mean, you’re the leader, you’ve put up a proposition that’s reported that has been knocked back. Now you’ve mucked around on the answer here, you’ve deliberately tried to avoid it, you’ve deliberately been misleading, how about answering it? Well, Neil, I’ve done the best I can and I’m sorry of I’m a disappointment but I’ve done the best I can. Oh, don’t play that trick on me. Yeah, I’m sorry mate. I’m being a wimp, ok? Q: You did an interview with Four Corners about two weeks after that [letter] in which the reporter asked you whether there had been any discussion with Terry Sharples about funding from any source and you said "Absolutely not". A: Misleading the ABC is not quite the same as misleading the Parliament as a political crime. But my memory - and I thought about that a lot at the time, what I think the reporter said, and I haven't got a transcript - was "'Is there any Liberal Party money behind this?" Q: The question was "So there was never any question of any party or other funds from any other source being offered to Terry Sharples?" A: And I said "there is no question of party funds". Q: No, you just said "Absolutely not". A fairly poor example of a lie. Sometimes we are faced with situations where we are not allowed to tell the truth. There is cabinet confidentiality. Or what is said in board rooms or between lawyer and client or doctor and patient. By not telling the truth or by denying suggestions as to what is said is the sort of lie that European resistance workers in WW2 said to the Germans when asked if they were hiding Jews or hiding downed British pilots. Lies of necessity. Or as the SMH says “dodging the truth” but for a reason. Have you proved he actually told a lie? The Nationals had been proposing a doubling of the baby bonus to $10,000 and that may have been taken up by Abbott – that is not quite the same as a $10,000 payment to stay at home mums (SAHMS). Considering Abbott could not reveal what was said in the shadow cabinet, he might have thought denying what was only partly right would get him out of it. It didn’t work and then he resorted to refusing to reveal what was said or proposed. Abbott was caught out, unprepared, hamfisted. Call him for that. But telling lies? He was badgered to reveal what happened in the shadow cabinet and after first appearing to deny, he realised he should have said nothing. That made him sound like a wimp as he admitted, but was the only thing he could do. What was your plan for a $10,000 payment to stay at home mums, the SAHMS? There isn’t any such plan. Then there was Abbott's controversial paid parental leave policy - something he once said would be introduced ''over my dead body'' but he now sees as a crucial way to differentiate himself from the social conservatism of the Howard years. He had said he would introduce no new taxes, but the parental policy was paid for by a ''temporary'' 1.7 per cent tax on big business. Except then a few weeks later he said the levy would be permanent, but might one day be offset by an across-the-board cut in company tax, which would leave small business even further ahead. In other words, he lied to the AEC. Then why does he make this misleading claim at all? It's simple: because unlike the various visitors to this forum of all political persuasions, the general public has many people who lack the ability to analyse political pronouncements and so sort out the rubbish from the truth. They swallow the most outrageous fallacies whole because they lack the capacity for clear thinking and do not know what a fallacy is. The same applies to some other political pronouncements which I won't go into detail here. I've noticed that Coalition supporters have (1) been very quiet about comparative interest rates in the last few years, and (2) have recently had a tendency to resort to this line of defence when the "Lower interest rates" claim was debunked. A simple way of checking it is to compare interest rates over the last 40 years. The general trend has been down with each passing government since the all-time high of 22% for some customers under Howard as Treasurer. You're shaping the argument in narrow terms specifically to paint Gillard in a bad light when Abbott's got his own closet full of broken promises with different wording. For example, Abbott's got his "rock solid, iron-clad commitment" of which more will be posted soon. Today's Abbott lie is his assertion that the Gillard government is "illegitimate", with connotations of winning government by a coup, as if Gillard won government with the military invading the lawns of Parliament House with tanks and artillery. This is a very obvious lie. In the Australian Federal Parliament, the Government is the group of politicians that commands majority support on the floor of the House. Gillard does. Abbott does not. That Gillard requires the support of independents and some minor parties to do so hasn't happened Federally for many years, but it is not that unusual given that every state and territory in the country has had a minority government in the last 25 years. Every single one of them. And not a question was raised about the legitimacy of these minority governments. Abbott claimed that the "carbon tax" would be a great big new tax on everything and would put the price of groceries up. New Daily Wire member swannysbasket has a site which blows a substantial hole in that one. How about recently announced super changes are "shades of Cyprus?" For this not to be a deliberate misrepresentation, Abbott would have to be so stunningly ignorant of the facts that he would not be able to do up his own shoes. The ABS would be indeed proud of the outgoing member for Lilley. Nice coding to get the interactive graph though. This was PM Gillard on 6 February 2013 repeating a promise made in 2010. Facing intense pressure over the past week about possible changes to the super regime that were leaked to The Australian Financial Review, Ms Gillard told Parliament Labor would keep its May 2010 assurance that people over 60 would not have to pay tax on payments from their superannuation savings. “The government reaffirms that it will never remove tax-free superannuation payments for the over-60s,” she said, referring to a commitment made when it released a review of the taxation system by former Treasury secretary Ken Henry in 2010. Apparently the new changes are not a broken promise since payments from super funds to over 60’s are not taxed but earnings on super funds. That is the equivalent of saying that interest on bank deposits will be taxed when it is credited but not when you withdraw it from the bank. As there are strict rules requiring a minimum of withdrawals from super funds if they are in the retirement phase (e.g. an allocated pension) then the difference between taxes on earnings and withdrawals is semantics. That didn’t stop the ALP from claiming that the opposition is telling “barefaced lies” about broken promises. Ms Gillard told parliament on February 6 that the government reaffirmed that it would "never remove tax-free superannuation payments for the over-60s" - a vow that repeated a similar statement from Mr Swan in May 2010. Coalition superannuation spokesman Mathias Cormann said the tax on earnings would reduce payments. "The government has shifted the goalposts by introducing a tax on super payments for the over 60s through the backdoor," Senator Cormann said. "It is a clear broken promise." Others drew a clear distinction between "payments" and "earnings" and said the Prime Minister's statement to parliament in February had left room for the changes announced yesterday. Mr Swan said the Coalition claims represented a "bald-faced lie" and there were no bounds to Mr Abbott's irresponsibility. "Yesterday he was saying everyone's super accounts were under threat - today he is lying about our announcement," the Treasurer said last night. OK, who is lying? Who is twisting words so that they no longer represent what most people think they mean. No tax on payments from super funds to the over 60’s. Err.... we won’t tax payments but we will tax earnings. Sure, Gillard, or rather the ALP, backed themselves into yet another corner that they should not have by ever implying that they would make 'no changes'. Abbott's reaction though, was at the level of a clever 9-year-old trying the make himself look good. A blatant misrepresentation designed to frighten older people. That's rather a stretch to assert this, especially given that Abbott is also proposing to force over 3 million Australians to pay more tax on their meagre savings so that he and 16,000 others like him can have more money. He is intentionally misleading the public and I won't accept a one-word response that handwaves away any discussion. It's not semantics. These are not the same. Withdrawals from the lump sum after 60 and before retirement are not the same thing as a revenue stream earned from investing the lump sum after retirement. Maybe he's been influenced by the use of small data sets by Bolt and others? Swan didn't do a very good job of emulating Bolt because his basket seems to be a random sample rather than cherrypicked from a larger set. I suspect it's actually pretty easy using standard code libraries.